Las Vegas, Nevada, April 2018 – By partnering with The Elkes Foundation and Jumping Cow Press, the 1000 Books Foundation is the proud recipient of thousands of copies of the highly praised “Cows Can’t” series. “We are a non-profit that is comprised entirely of non-paid volunteers. Every dollar of this $10,000 direct-impact grant will go towards supporting 1,000 Books Before Kindergarten early literacy challenges nationwide”, said Diane A. Lee of the 1000 Books Foundation. “These titles are fantastic and are perfect for the age group that we serve,” said Ms. Lee. 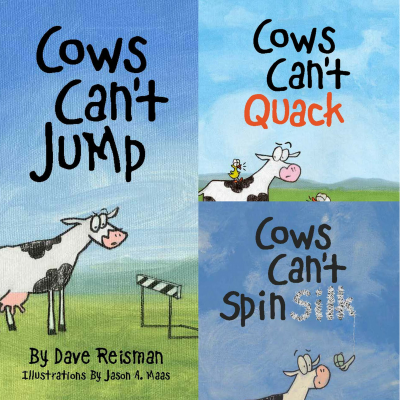 “Cows Can’t Jump”, “Cows Can’t Quack” and “Cows Can’t Spin Silk” were created with early readers, ages six weeks to six years, in mind. “Cows Can’t Jump” focuses on actions, “Cows Can’t Quack” focuses on sounds, and “Cows Can’t Spin Silk” focuses on creations. The series features over 50 different animals and has become a staple of early childhood literacy programs nationwide. To learn more, please visit: http://www.jumpingcowpress.com/.